In one of his first articles, Ryan Holiday, the bestselling author, media strategist and former marketing director at American Apparel, talked about how reading a stoic book in his first college year has changed his life. It turned out to be hi “quake book” – one that shook everything he thought he knew about the world. When someone you highly admire says something like this about a book, you are curious to learn more, obviously 😀 And I don’t regret it. Discovering stoicism was one of those paradigm-shifting moments of my life. It helped me become less anxious, more calm and content with what’s going on in my life. But what is stoicism? It’s a practical, down-to-earth philosophy that was developed in ancient Greek, a few centuries B.C. 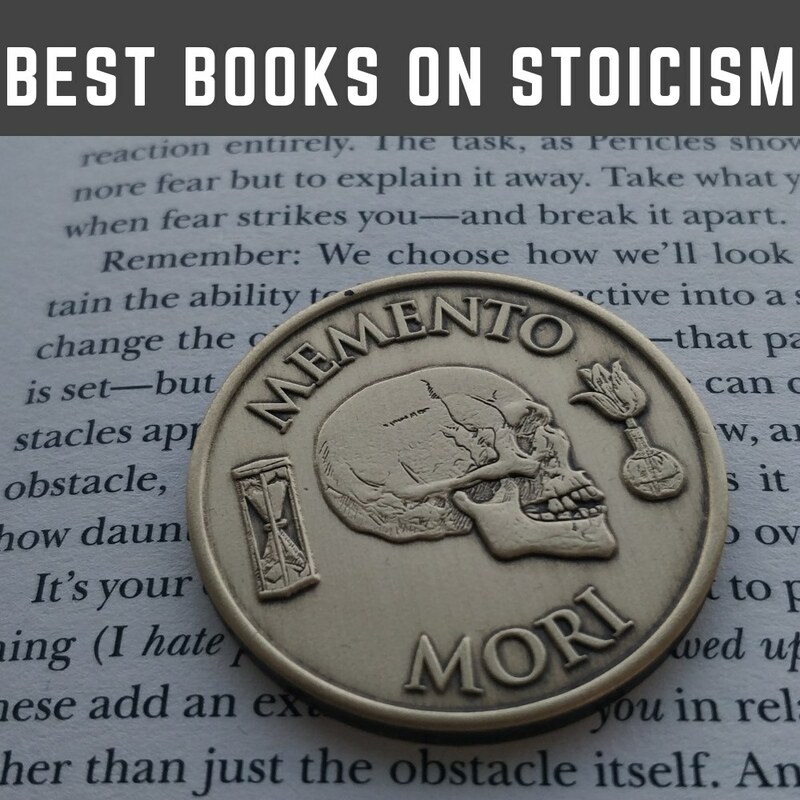 Thanks to Ryan Holiday’s work, who wrote a few books and tens of useful articles about it, stoicism has made a comeback in the recent years. The basic principle of stoicism is that we don’t control everything that happens to us in our life, but we do control how we respond. It’s a framework that’s extremely practical when it comes to coping with stress and the chaotic modern day environment. Now don’t get me wrong, practicing stoicism is just like any other habit: if you don’t do it on a daily basis, it won’t help you that much. You can’t workout at the gym 3 times per day during January and expect the results to last all year long. 1. Distinguish between things that are under your control versus those that aren’t. This one emphasis the importance of focusing on things that are under our control instead of freaking about the results. It’s the kind of detachment that reframes our perspective. Instead of reacting emotionally and worrying about things that we can’t influence, such as what other people might think or say, you focus on the process and things that are directly under your control, making sure you do everything that is in your power. Imagine all the things that could go wrong in your life – they might be related to personal or professional matters. This stoic exercise comes at hand before you make a decision, and also makes us more grateful – we’re always taking things for granted and risk becoming complacent. It also helps when it comes to small things. For instance, before you leave home for a meeting, you can visualize in advance how things might go wrong and take the appropriate measures. If it’s raining, you might consider leaving earlier to beat the traffic jam, or put on a raincoat and take the subway instead. Always ask yourself what’s the worst thing that could happen. Define those fears and risks, and figure out what you can do to build a moat and prevent them from happening. Do limited-time experiments where you cut out things that you normally take for granted. For example, you can go out without a jacket during a colder day, fast for one day, or completely cut out coffee for one month. The purpose is to be prepared in case we actually have to face physical hardships and sh*t hits the fan. Ryan Holiday wrote some of the best modern books that draw from stoicism. So far, he’s released two books out of a trilogy dedicated to this ancient philosophy: The Obstacle is the Way and Ego is the Enemy. The third book, Stillness is Key, is announced to be released in October 2019. 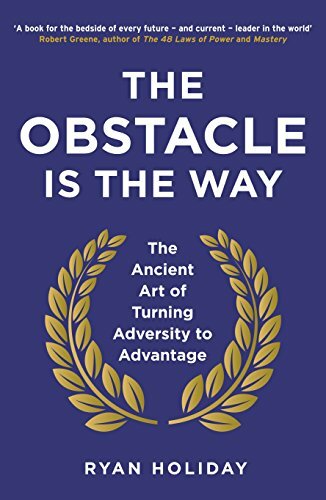 “Ryan Holiday’s book, The Obstacle is the Way is a great read for any entrepreneur feeling frustrated with time and process. The reality is that the hardship and roadblocks that take 10 years to get through are the payment for success. You have to learn to embrace the process, not the outcome. A Guide to the Good Life is another great modern book, written by William B. Irvine, a professor of philosophy. Irvine offers a fresh perspective on Stoicism and a roadmap to how we can use it to become more tranquil, minimize worry, deal with challenges and live a better everyday life. 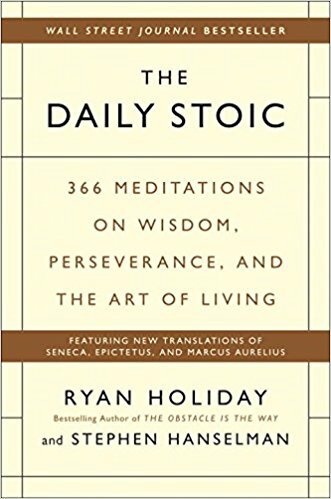 Another great stoic book from Ryan Holiday is The Daily Stoic – it has new translations from historical stoics, compiled into daily nuggets of stoic wisdom that you can read throughout the year. I also highly recommend that you subscribe to The Daily Stoic daily newsletter and browse the website – it’s the best free resource on stoicism you can find. Lots of great content there, including long articles with stoic reflections, exercises, and interesting interviews with stoic entrepreneurs and authors who talk about how this ancient philosophy has changed their lives. This is probably the best free resource on stoicism. This is the book that Ryan Holiday read in 2006 and became his “quake book” – one that shook everything he thought he knew about the world. He also has an extraordinary mega-guide with 100 lessons learned from reading this book multiple times in 10 years. Marcus Aurelius ruled the Roman Empire, ascending to the throne in 161. His reign was challenged by natural disasters and wars, being attacked from all sides. ‘Meditations’ is a series of private reflections he wrote in his journal about stoic detachment from things that are beyond one’s control, in the face of obstacles. Seneca‘s work is a must-read if you want to dig into stoicism. He was the advisor and tutor of Nero, the Roman Empire, for several years of his life, and wrote the Moral letters to Lucilius when he retired. 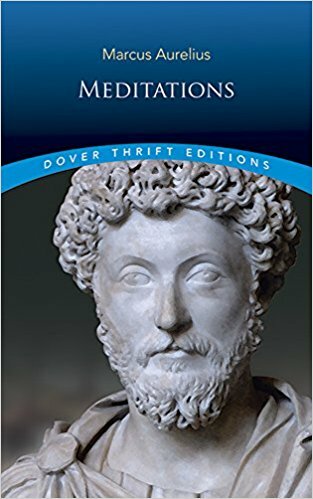 It’s a collection of 124 letters that cover a wide variety of moral problems, presenting a unique form of stoicism. Speaking of entrepreneur, investor and author Tim Ferriss, he’s also a stoic. Ferriss read Seneca’s “Moral Letters to Lucilius” “dozens of times” and loved it so much that he turned it into The Tao of Seneca, a three-volume set of audioboks. Ferriss also has an incredible TED talk that has millions of views, about how stoicism helped save his life when he was depressed and had suicidal thoughts – highly recommend you see that one was well: Why you should define your fears instead of your goals. Ending this list with another personal favorite: Epictetus’ Manual. Epictetus was a slave turned teacher who deeply influenced Marcus Aurelius. “Despite being an avid student of Stoicism for many years, I somehow never got around to reading the last of the three big stoic writers, Epictetus, directly. What a mistake. The Manual is a profound work. It’s perhaps the most tensely packed tome of wisdom I’ve ever had the good fortune to read. Seriously. You can read it in about an hour, but you’ll spend weeks, years, hell, probably the following lifetime, trying to internalize and master its hard-hitting truths and techniques. Have you read any of the stoics? Did you find them helpful? Drop us a comment & let us know your thoughts!